Feel free to consider yourself tagged as well, IF you do it, please remember to credit me as the source of the tag, and feel free to use the image above too. Either tweet me or (ideally) leave a comment with your post URL of the tag, and I'll add it to the bottom of this post so others can find all the summer tag posts :) Lets get on with the questions! Well, I'm not sure if this is a Summer thing or a pregnant thing, but at the moment I'm drinking loads of milk with strawberry crusha in it, pretty much can't get enough of it! NOM NOM NOM! Who had forgotten that crusha existed until you just read that? Neither! Dresses and skirts really don't suit my shape, I mean, I really really don't look good in them! I stick to jeans all year around I'm afraid, it's the most flattering thing I can wear. However, as my pregnant bump grows, I will end up having to wear maternity maxi dresses this Summer, I just need some sun to come out so I can! Ballet pumps definitely - however, I do tend to wear leather shoes all year around too, they help stop my feet getting puffy as they're putting pressure on my foot all over, if I wear ballet pumps, my feet tend to get a little swollen. Aww thanks :) I hope you like the perfume! Oh, I'll do it, but will have to find a day to post it as I have scheduled like the entire month! hehe! I look funny with my hair up too! Brilliant tag! 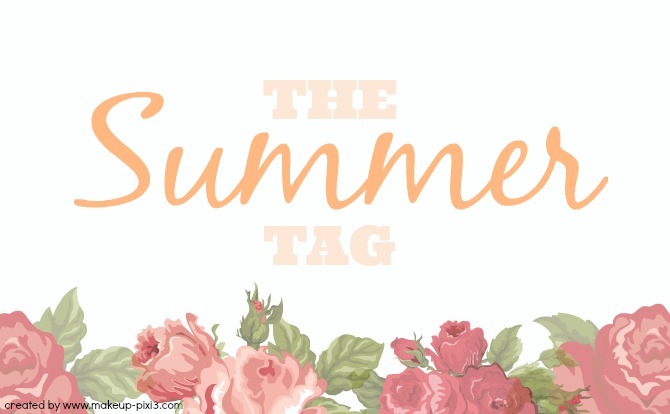 Never done a blog post tag before, and was a perfect one to do - here's mine: http://thelondongirl788.blogspot.co.uk/2014/06/the-summer-tag.html and thank you for the ability to use your picture! I love this tag! I just posted mine. Thanks for starting this! Lacoste Touch Of Pink totally takes me back! I've done the tag too!